"The images to behold in this lawless city are absolutely piercing. Relentless terror and intoxicating beauty will compete for your attention at every step. It's not the safest place in the world, to be sure. Just use your own good sense and don't panic. Remember that Asylum is, for better or worse, like any other city. Only MORE so." "It may be dangerous, but it's never dull." Virtually any commodity or material good can be obtained from the markets of Asylums streets. As for natural resources in the environment, Asylum builds ships with local lumber, plucks fat fish from the river and ocean and bakes bread with locally grown Rhen wheat. Asylum is the largest city on Khoras and the most lawless. Estimates place the population of Asylum at more than three quarters of a million, but the true population can only be guessed at. Asylum is a conglomeration of merchants, thieves, bandits, soldiers, renegades, assassins, mercenaries, outlaws, cutthroats and more. Barfights, riots, protests and general chaos are normal and common. Because of this, Asylum is earned the nickname "City of Thieves". Asylum was originally a maximum security detention facility owned and operated by the Traxx Legion before the Great War. It was a large stone keep with numerous prison levels beneath that was on the outskirts of the town of Shirdan. One prisoner, Symok, claimed he had been wrongfully convicted. When the great Traxxian revolt occurred in 771 CY, a full scale military coup was unleashed and the nation was plunged into political and military chaos. This provided Symok the opportunity he needed. Symok and a small band of fellow prisoners quickly wrestled control of the prison from the Legion. All guards were killed. Weapons and equipment were taken. The heavily fortified prison was converted into a fortress. It served as a base of operations from which raids were launched. The prisoner-turned-bandits quickly gained control of the town and the surrounding lands. Symok organized his followers into an effective military force, about eighty strong. Most of the inmates had already fled, but many decided to stay. Some even came back to serve. Symok crowned himself King, renamed the town "Asylum" and declared it independent of the Traxx Legion. The Traxx Legion tried several times to dislodge the rebels from their newly acquired fortress, but every siege failed. The Traxx Legion was also quite busy dealing with its own problems. Eventually, internal conflicts tore the region apart and the Legion broke up. Through all of this, the prison fort remained politically independent. Symok declared that any person willing to work and fight was welcome. Many took them up on the offer. The rule was "A hard days work earns you a meal". Arrangements with landowners to the north ensured a supply of wheat to make that rule a hard certainty... something that could be counted on. Hundreds of refugees in the post Traxx era eventually flocked to Asylum even as the Traxxian Legion was coming apart. Asylum grew quickly. Everything was declared legal and a strong economy soon developed. The city gates of Shirdan were burned and the city walls were toppled. Symok declared that Asylum was a free city... no laws to limit freedom, no taxes to service the wealthy, no walls to divide the people into classes. All may come and go as they please. Today, Asylum is a huge, bustling community. It has remained true to Symok's declaration. There are no taxes or laws of any kind in this city. There are no guards or judges. It has evolved into a wild, lawless expanse of buildings and tunnels, mercenary companies and bandit groups. In 2413 CY, there was a great fire which destroyed almost 20% of the city. Only through the combined efforts of many citizens, two thieving guilds and three wizards was the fire put it. The original prison fortress still stands at the center of Asylum. Control of this building has changed hands many times over the centuries as first one and then another group was forcibly routed from it by a superior force. Various organizations within the city still fight over this massive keep. It's location is ideal. Its integral part in Asylum history is worth bragging rights for those who hold it. The keep's many dungeon levels underground probably hold many secrets from the past. Asylum is the perfect example of anarchy. It has no central government and no single group has legitimate authority. Several of the more powerful groups oppose each other and a delicate balance of power has resulted. There are several sections of the city that have become dominated by certain groups. Many of these city sections and power groups are detailed below. Some districts are safer than others. But overall, in this city, alliances are rare and trust is difficult to find in this city. It is an unwritten rule that "Justice belongs to the strong." It is tradition that anyone who is running/hiding from something can usually "disappear" in Asylum. Once someone has made it to Asylum, then they are on neutral ground and it is every man for himself. Of course, Asylum itself can be extremely dangerous. There is no single organized military force in Asylum. However, Asylum has an immense population and large concentrations of warriors, mercenary groups, private militias and other such pockets of military strength. The only nations close enough and strong enough to pose a significant threat to Asylum are the Coalition and the Pirate Isles. These two groups have not bothered, though, due to Asylum's location and distance. The Drakkellian Alliance prefers to use Asylum as an economic partner rather than attempt a military takeover. Despite the lack of governmental control, a thriving economy has developed. Anything can be purchased in Asylum, though prices are high. Asylum has strong economic ties to the Drakkellian Alliance and a river of goods and money flows between the two. The majority of the citizenry is composed of thieves and rogues, assassins and cutthroats, bandits, mercenaries and fugitives. Lawless violence is the norm. Prostitution, gambling, drugs and slavery are common. Asylum is a dangerous city. Shanghai gangs roam the city districts assaulting and kidnapping strangers. Visitors to this lawless city who aren't careful could get a knock on the head and wake up at the oars of a galley or worse. Sanitation in Asylum is a large problem. The sewer system is ancient and overwhelmed by the sheer size of the population. If it were not for the frequent tunneling and maintenance of the dwarves and criminal organizations who use the tunnels and sewers, the system of sewers would have collapsed long ago. Garbage and sewage often flows freely along the gutters along the sides of the streets. Disease and rats are common. Flesh fungus, bore worms and the like are a frequent problem. Because of all this the river is heavily polluted and swimming in the tainted waters is sure to sicken the offender. Because of the fragmented nature of Asylum and the fact that so many different cultural and racial areas exist, the city of Asylum has dozens of minor festivals every season. Almost every day, some part of the city is celebrating something. Some of the larger festivals are celebrated city wide such as the various Season Festivals and the Sundering Festival. There is no central government, but there are many powerful groups in Asylum. These groups often spy on each other, steal from each other and fight over territory and resources. This complex power struggle creates many economic opportunities and it is within this fertile economy that the city has grown. One of the ruling guilds of Drakkel, Prad Ironwork maintains a significant presence in Asylum with a large office and several heavily fortified warehouses. Prad specializes in armor and weapons and, in this city, Prad has no shortage of customers. Heavily guarded wagons transport raw ore from the mines to the craftsmens shops, finished goods about the city and profits back to Drakkel. This organization is known simply as The Guild. It is run by a man who was formerly with Prad Ironworks and has many ties to Drakkel. This organization has formed from former offices and guild members of Prad and other Drakkellian guilds. Now, completely independent, the Guild has evolved into a crime cartel which opposes the Company. While small, the Guild has been very successful and is growing. Over the past 10 years, it has successfully stolen much business from the Company and is becoming a problem for the latter. The two crime cartels oppose each other at every turn. The Guild maintains several offices, warehouses and hideouts scattered throughout the city. The Guild's main fortress like headquarters sit on an island in the harbor. It has its own private docks and a small fleet of ships. The Company is the largest and most powerful crime cartel in all the southern lands. It has a major presence in Asylum with hundreds of operatives and likely dozens of hideouts. It is a sure bet that the Company has a hand in almost every crime committed in this city. However, the Company maintains a cloak of secrecy over all operations and never reveals itself. If the Company has a main headquarters in Asylum, no one knows where it is. Because of this secretive nature, it is impossible to say how large the Company is in Asylum or how intertwined it is with underworld activities. The Shields is the name of a major mercenary organization that operates out of a huge, rebuilt fortress. This group, some 3,000 soldiers strong, hires out guards for a fee. The Shields will also act as a full police force for those that can afford it. For the wealthy, the Shields can also offer up highly trained body guards. They have even been known to perform investigative services. The Shields are led by Lord Barrington, a paladin lord and servant of Barrinor. Under his authority, the Shields charge themselves with bringing law and order to this corrupt city. As such, the Shields are the only significant force of law and order in the city of Asylum. This organization is a very large and powerful thieves guild that operates in the open. The Vipers steal from everyone, by they simple merchant or crime lord. The group is headed by Tresalle (detailed below). The Vipers operate out of a large stone keep in the south end of town near the docks. The agrarian guild is a farming cooperative which is one of the most powerful guilds in the city. This organization is more than 5,000 strong and operates under the control of a dozen grumman families. It employs mostly grum and humans. It maintains a near monopoly on food entering the city and this has made the guild quite wealthy. The Agrarian Guild transports foodstuffs (wheat, milk, eggs, butter, corn, beef, mutton and other common foods) from huge community farms in the grumman lands to Asylum. The food is transported in huge heavily armored wagons with many guards for protection. They have several fortified warehouses that store huge reserves of food. These security precautions are necessary because poverty and starvation in the city make food as valuable as gold here. The guild makes deliveries from these warehouses to various parts of the city – to the inns, taverns, guild halls, etc. Asylum has a huge beggar population. About 3% of the city are beggars (almost 30,000) and most are members of this guild. The sheer number of beggars makes this group a force to contend with. The beggars have banded together and formed a rudimentary guild that has meeting halls, leaders and planned events. This guild is home to the poorest and most wretched souls in the city. This guild is more than just stone cutters. It accepts all craftsmen into its ranks. It consists of some 1,000 skilled craftsmen and 10,000 unskilled laborers and guards. The Stonecutters Guild specializes in architecture, building and repair. Their work involves buildings, bridges, roads, walls, statues and the like. To a lesser degree, they also dabble in wagons, armor and small boats. The Stonecutter's Guild is very mercenary in its politics. They will build, repair and destroy anything for a price. This company has Kalimuran ties and is run by a pair of Kalimuran brothers. The Stonecutter's Guild is responsible for most of the buildings in the city. Because of frequent tavern brawls and turf wars between street gangs, there is always a need for rebuilding and repairing and this keeps the guild quite busy. A huge group of orcs have settled in Asylum and have taken over one section. That city district is now called Orctown. The Blood Horns are ruled by a very powerful orc known as Azgug the Deathfist who is said to be able to kill with a single blow. He is served by Julkurath the Dark, a powerful orcish shaman. Orctown is also home to a large number of saurians, goblins, ogres and other foul humanoids. This is a very dangerous area for human, elves and grum. This predominantly human region of the city has developed a rudimentary government and this district has become somewhat safe. The leader here has hopes of spreading the light of civilization to all areas in the city and eventually turning Asylum into a proper civilized place. This is one of the few safe regions in Asylum. The Citizen's Coalition is allied with the Shields. The population is mostly human here, but elves, grum and other good folk are welcome. Orcs, ogres and the like will be watched closely and thrown out if they cause trouble. A ruthless street gang that revels in chaos and causes trouble where they can. They are trying to nurture the “perfect chaos” that Symok originally created when he founded the city. They are opposed to any individual or group that would seek to impose order or civilization on Asylum. They roam the city in packs, stealing and harassing indiscriminately. They will focus their efforts against caravans, public events and the like. The Swords of Symok fight with everyone except each other. The Swords are particularly enraged by the Citizen's Coalition and the Shields and will often attack them on sight. An old wizard of despicable evil and potent magical power has declared a section of the city as his. He has taken over one part of town and has many orcs, ogres, goblins and evil men that do his bidding. He has no desire to take over all of Asylum and seems content to play the other groups against each other. Varkorim is served by Gargaroth, his ogre bodyguard and lieutenant. Varkorim is having his minions build him a great citadel in his city district. They have been working on it for four years now and it is almost half way completed. Soon, Varkorim will be moving in to it. One small section of the city is ruled by Lord Domler, a very wealthy noble. He employs several hundred people on his estate and operates a number of small business. Lord Domler is, actually, a Knight of the Abyss, an anti-paladin and an agent for Duthelm. He spies on many people in Asylum and reports back to Duthelm via magic. The Slave Lords are a large organization that span much of southern Ithria. The organization has several offices in Asylum. Asylum is a port for the slavers where their ships come in. Here they have a processing center where newly captured slaves are cleaned, trained, broken (if necessary) and shipped out. Some slaves are sold here in Asylum. Others are sent back east. One of the more dangerous bandit groups is a street gang that call themselves the Slayers. They hold a burned out husk of a building as their meeting place. They are led by Algar the Elfslayer, listed below. The Slayers are petty thieves and thugs that use stealth or force to prey upon the weak. This motley collection of ruffians is mostly human, orc, ogre and saurian. They have been known to ambush caravans coming into the city, kidnap for ransom and bully people on the street for money. They even once stole a ship. Hammerfall is the name of an entire section of the city. Once just a dwarven guild, it has grown in size and encompassed an entire section of the city which has now walled itself off. The buildings of the part of town have been rebuilt with skybridges connecting many of them. The dwarves of Hammerfall are expert craftsmen, blacksmiths and stone masons. It is said that Hammerfall has many subterranean levels beneath the buildings and the dwarves hoard much treasure there. The War Guild, as the name implies, is the warriors guild of Asylum. They are an independent mercenary company, a guild of fellow warriors and a combat school, all in one. Their emblem consists of black crossed swords on a blood red field. The War Guild opposes the Shields as a rival company of soldiers. Where the Shields are a force of Good, the War Guild tends toward evil. As such, the War Guild hires out bounty hunters, assassins, thugs and mercenary warriors. It trains anyone who has money and wants to learn to fight. On the side, the War Guild runs a variety of protection schemes to extort money from the commoners and small businesses in the city. The War Guild has ties to several bandit groups in the area. It is led by Dorevose, a well known sword master who made a name for himself in the ranks of the Coalition. The War Guild operates out of a stone keep in the north end of the city. Below are listed the major organizations that rule here and how the city is divided up among them. There are rumors that the dwarves are stronger than anyone in Asylum knows, that many dwarves live and work in the tunnels below and that they have many tunnels and chambers beneath the streets of Asylum that no one knows about. Every month, there is a new rumor about the Old Prison. Usually people say that the Old Prison is "under new management" when some new gang or crime cartel has ousted the last residents and taken over. A son of a wealthy Drakkellian businessman has fled home with a great treasure stolen from his father and come to Asylum. Rumors state that his bodyguard died in a tavern brawl and the young noble fled. He is now wandering the city alone. Several groups are looking for him and this supposed treasure he carries. 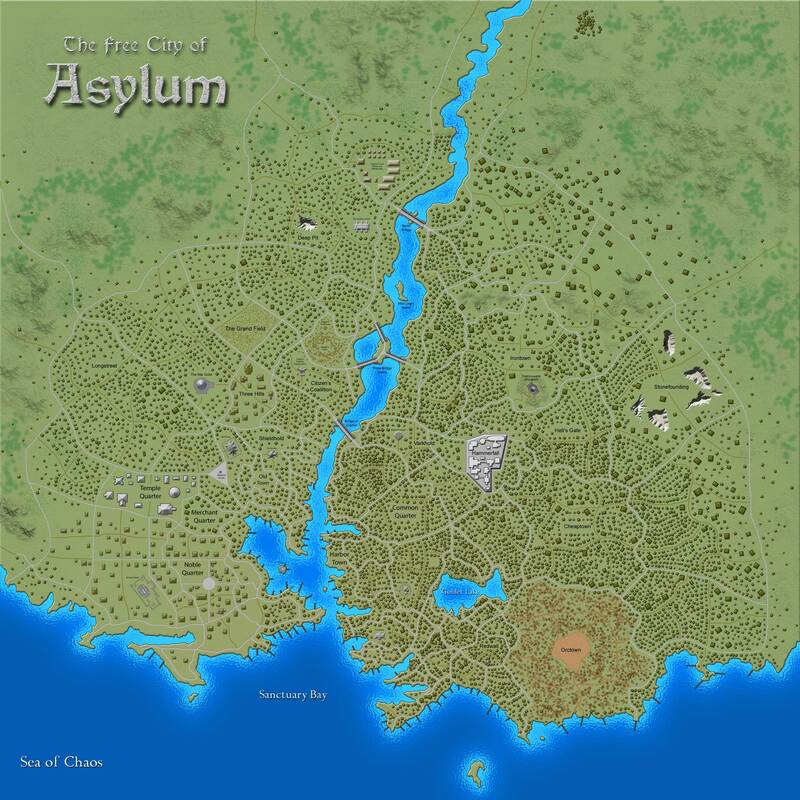 Below are listed the districts and wards the divide the sprawling city of Asylum. Noble Quarter Lord Domler and several others who claim noble birth live here and pay well to keep it safe and secure. Merchant's Quarter Most shops and guilds can be found in this section of town. Temple Quarter Most of the major temples can be found here. Common Quarter The largest town district where many thousands of commoners live. Oldtown The oldest section of the original city of Shirdan which is still standing. The Old Prison stands at the center of Oldtown. Barker's Corner A huge open paved triangle at the junction of three roads that borders Oldtown. The Statue of Symok stands at the center of Barker's Corner. Shieldhold The region of town controlled by the Shields. Three Hills A slightly wealthier section of town where several wealthy merchants live. Harbor Town The harbor district. Irontown The city region controlled by Prad Ironworks. Hammer Fall The region of town controlled by the dwarves. Cheap Town A large, disease ridden and poverty stricken part of town. Very dangerous. Orc town The orc district. Home to a small nation of orcs. Varkhold The region of town controlled by Varkorim the Wicked. At the center of this city district is the construction of Varkorim's new citadel, half finished. Hell's Gate Another poor, crime ridden section of town. Stonefounding A major stone quarry can be found here along with many miners and poor, unskilled laborers. Deep Pit Home to several mines and quarries. Run by Prad Ironworks. Longstreet The longest street in Asylum runs through this district. Redwall Probably the deepest and most dangerous section of the city. Warfare between five major street gangs is constant here. Anyone walking into Redwall without arms and armor is asking to die. The streets of Asylum are illuminated at night by small fires lit in huge iron pots that sit on squat, but ornate, stone pedestals about 1 meter (about 3 feet) high. These fire pot pedestals, which date back centuries, provide both light and heat and a means for any traveler, beggar or passerby to cook food. Whether or not these "street lamps" are lit depend a great deal on where you are. Some sections of town maintain their street lamps and light them every night. Other parts of town are so run down and wrecked that the street lamps were destroyed long ago. It is not uncommon to see street urchins or beggars cooking rats for dinner over these fires. There are many kilometers of sewer tunnels beneath the streets of Asylum and there are hundreds of other tunnels that connect to the sewers in a labyrinth of secret routes and hidden doors. Thieves and spies of different guilds and groups use these tunnels. It is known that the dwarves of Hammerfall maintain many of these tunnels and even demand a tax of those who would use them. It is rumored that the Hammerfall dwarves have many other tunnels that they keep for themselves alone... tunnels which run deeper and farther than is generally known. One rumor even claims that the dwarves are building something big down there. The origins of the name are unknown, but this immense stone bridge is the last and largest of all the bridges spanning the river. The Bridge of Cuphal sits a quarter mile for the river's mouth and the opening to the harbor. It is a very broad bridge with enough room for several wagons to cross it abreast and it is taller enough for even a large ship to pass underneath. The Bridge of Cuphal is one of the last great architectural wonders of the original city Shirdan. The northernmost of the bridges along the Asylum river. Due to its nature, Asylum lacks the usual government establishments. It has no government center, no military headquarters, no official mint, no major universities or any other public enterprises. The only "public" place which is maintained is the Grand Field. The Grand Field is the common name for Asylum's largest open air market. It is little more than a square lot half a mile across where no buildings currently stand. It is filled with several hundred booths, shacks, tables and tents which are organized not at all. This place is always crowded with throngs of buyers and sellers. Winding paths meander through this maze of charlatans, jugglers, craftsmen and farmers. This is a very unorganized place and there is no city guard to keep the order. Brawls are common. Pickpockets are everywhere. Everything is legal and welcome here. Drum circles, chanting and other forms of social interaction occur spontaneously. The Grand Field is always active, day and night. Asylum has no city guard. This is worth noting. If visitors to this city get into trouble, they cannot count on city paid guards to break up a fight or arrest troublemakers. Various groups and organizations within the city may maintain their own guards and police forces, but for the most part, everyone in this city is own their own. It's difficult to say where Asylum's underworld begins and ends. So many criminal groups operate out in the open that Asylum's underworld is very much on the surface. Many thieves guilds and crime cartels are intertwined with legitimate businesses in a complex economic web. Asylum has a wide spectrum of religious beliefs represented in its population. Places of worship to almost all deities can be found within the city walls. Dozens of shrines and altars are scattered about the city ranging from small, ornate buildings to mud-covered hovels and shacks.The largest temples in Asylum are devoted to Daramis, who is something of a patron deity of this lawless city. Semorjon, Kael, Three Fates, and Magrizath are also widely worshipped here. This husk of an old stone fortress remains silent and forbidding. The general public of Asylum knows the stories of the old prison and its vast and horrible dungeon beneath. That it's still in use by one or multiple groups of shady characters is certain. In the crowded city, there are as many rumors about this as there are people. The most common story is that the leaders of the many thieves' guilds meet within its walls, to haggle over territory. Any fool who dares enter the prison out of curiosity is taking his life into his own hands. Most people simple ignore it as just another landmark. Near the old prison is a 6 meter (20 foot) copper statue of Symok, the founder of Asylum. It is weathered and green with corrosion, but still standing. The inscription at its feet is still legible and reads "A hard days work earns a meal. Let this be the only law - Symok". The Swords of Symok, a street gang, consider this statue their property and protect it against any who would take it down. An island that sits in the middle of the river and connects to the mainland with three bridges - two on one side, one on the other. This bridge island system conveys most of the traffice between the two halfs of the city. A well known criminal boss and ruler of the underworld, Tresalle operates a large and successful guild of rogues from within a well guarded stone keep in the south end of town near the docks. Tresalle is a large man with long curly black hair, heavy garments and too much gold jewelry. He tends to sweat a great deal in the southern heat. He has some three hundred people in his employ. Tresalle operates a large number of scams and protection rackets throughout the city. He is a well known and easily recognized figure with many enemies. Needless to say, he never goes anywhere without his half dozen body guards. A well known and well paid assassin who knows the city of Asylum better than most and always gets the job done. Although it is known by only a handful of individuals, Martin combines his skill of blades and poisons with a solid education in spell craft. He utilizes a number of spells in his trade, but is careful to keep such tricks hidden to keep his prey unaware. Martin is an expert at disguise, both magical and mundane, and maintains a cloak of secrecy over his identity, appearance and even race. The only thing that most eye witnesses can agree on is that he is tall... and deadly accurate. The very reclusive ruler of the Company. Although usually found in Drakkel, Jaedo has many holdings and contacts in this city as well. A huge and heavily muscled full blooded ogre known for quick reflexes and excellent fighting skills. Algar is known as the Elf Slayer and he carries a huge double headed spear. This massive weapon is enchanted with powerful dweomercraft and has likely butchered hundreds of elves. Algar is the leader of the Slayers, a large bandit group that terrorizes and bullies any they can find. Meadon Olbrata is a wealthy and influential guild leader. Olbrata has managed to expand the ranks of his guild over the years and maneuvered it into a position of controlling various business interests within the city. There is much profit to be made in a city with no legal or commercial restrictions. Even though there is much violence and lawlessness rampant throughout the city, various commodities are still needed. Olbrata has organized several businesses who pool and share resources. He has also gone to great lengths to protect his business interests from attack. Olbrata has very good connections throughout the city. He tries not to attract attention to himself, preferring to be the man who pulls the strings from behind the curtain. 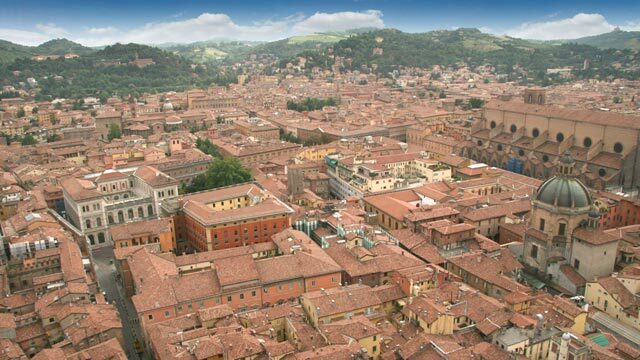 Those people who know this city well know that Olbrata is the man who can obtain anything in Asylum. Known as the finest swordsman in the south lands, Phendar is something of a mystery. He is a human male of modest stature and unassuming airs. When he slew a trio of orcish warriors in a tavern brawl, he was noted as a skilled swordsman, but little else. However, when the brother of one of the slain orcs showed up a week later with a group of twelve ogre warriors, things got more serious. Phendar again proved victorious and slew all thirteen opponents without spilling his drink. That evening, his name spread through the town like wildfire. Since then, citizens in the city tend to stay out of his way and even the most fool hardy bandit will give him a wide berth. Of course, the occasional drunk or young duelist will challenge Phendar, only to end up staining the street with his blood. Virtually nothing is known about Phendar except that he has a sharp blade and blindingly fast reflexes. He tends to keep to himself and is evasive when asked about himself. He has hired himself out on various occasions as a guard, a warrior, an assassin and a bodyguard. He never stays with one job for long. Those who know Asylum and its people say that he is searching the city for something and this is likely true. He never leaves Asylum and wanders the city frequently. It is not unusual to find him walking the city streets at night. No one knows what he is searching for and he will not say, even if the matter is pressed. Phendar has a tendency to sharpen his sword (a magnificently balanced and bejeweled sabre) in an absent minded way when deep in thought. He is soft spoken and has a disconcerting habit of informing a person that "That's one" whenever they have annoyed him. When a person reaches "three" such annoyances, he slays them. No argument, no reprieve, no mercy. It is usually a quick death, so quick in fact that no one ever sees the sword stroke. Nowadays, when a person reaches two, they tend to leave town. Gevai Inn/Tavern - The largest inn/tavern in Asylum. Although expensive, this is also one of the safer places for a traveler to stay. This is because the owner Gevai employs a number of bruisers, mostly ogres, to stand watch and keep the peace. He pays them very, very well. Redmond Gray Tavern - This tavern pours what is most likely the most concentrated Blackfall to be found. If survived, it's a once in a lifetime experience. Large, violent men having hallucinations about dragons can be extremely dangerous to be around, so patrons should be aware and take care. Blackfall is, of course, highly illegal everywhere except for Asylum. Argus Tavern - A small two story establishment of stone and wood. Run by an ex soldier named Argus who is half-orc. This small establishment is dirty, run down and the average quality ale is watered down. However, Argus is a good cook and there is usually a large hunk of meat roasting over the fire. This is a good place to lay low when evading pursuit. Abrus Inn/Tavern - A small tavern run by Abrus, a half dwarf who is blind in one eye. He keeps a good clean inn, has reasonable prices and good food. His specialty is something he calls dwarven mustard soup, a thick yellow chowder that is very hot and spicy. Horvec Brothel - A well-known brothel in Asylum. It is run by Horvec, an orcish ex-military officer who has the weapons and skills to protect his girls. Dorevose Guild Hall - This guild of warriors offers individual mercenaries and fighting companies for a reasonable price. Guild members can usually be spotted proudly bearing the War Guild medallion, with a blood-red field and black crossed swords. Crack Jack Gambling Hall - A large and successful gambling house in the south quarter of the city. Owned and operated by Crack Jack, a cunning grum businessman. The establishment is rumored to have ties with the several underworld organizations throughout the southern lands. Evak Guild Hall - A large guild house owned and operated by the Rukemian Slavers' Guild. This is often a stopping point for caravans and ships transporting slaves back to the empire. This guild house operates a huge slave market for Asylum, unhindered by any law. Daggen Smithy - Daggen is a very popular town blacksmith. On the second and fifth day of every week, he loads up a large cart filled with finely crafted weapons and then parades it through the main streets of town. Two elven brothers are in his employ, both expert crossbowmen. They keep his mobile business quite safe. Several thieves on the run, fleeing a better-armed opponent, have been able to turn the tides on their adversaries by happening to run into Daggen's roving arsenal at just the right time. It's precisely these life and death situations that Daggen loves to take advantage of. One time he scored so great a profit that he was able to buy a fine summer house on the coast. Ren Oliff General Store/Apothecary - Oliff runs a very large general store and apothecary that specializes in wondrous variety. One curious thing is that for such a large establishment, no hired guards are to be found. And yet Oliff boasts that he's never had so much as a toothpick stolen from his store. Some say that he's really a powerful wizard who uses dark magic to protect his business, others say that he's a lucky old fool who talks too much. various or none Arena/Market - The largest and most dangerous open air arena and "market" on the continent. Those with violent compulsions and freak sexual fetishes flock here from all the lands to participate in orgies and gamble over duels to the death, get drunk on things other than alcohol, and have a good time or literally die trying. The Ring almost seems to run itself. Very chaotic and very wild. Deaths are a daily thing here. Sometimes, those wishing to take their own life for whatever reason will come here and put out a contract on themselves, to die in the most extravagant way possible. Other similarly deranged folk will simply stride into the middle of the arena floor, hold up a sword and take on all comers. Travelers in Asylum for the first time would do well to avoid this place altogether. For those who wish to go anyway, the advice is simple: Watch Your Back. Gilrin Menor Naval Store - The Jolly Roger is a large naval store, but it is much more. Master Gilrin Menor, with the help of a dozen assistants and dockhands, runs the shipyard, the docks and several large warehouses. All ships arriving in Asylum check in at the Jolly Roger. It is here that captain's pay docking fees, arrange for maintenance on the ships and meet their contacts for unloading their cargo.